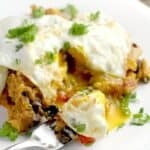 Insanely healthy, slow cooker quinoa with simple, wholesome ingredients and topped with a beautiful sunny egg. 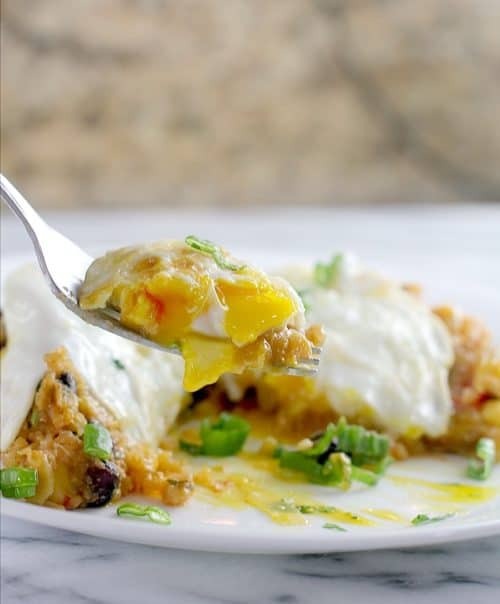 Keep the fiesta going this month of May with a creamy, flavorful dinner reminiscent of tamales. OK, so I am going to gush here a minute. Because RO*TEL Diced Tomatoes and Green Chilies is special. 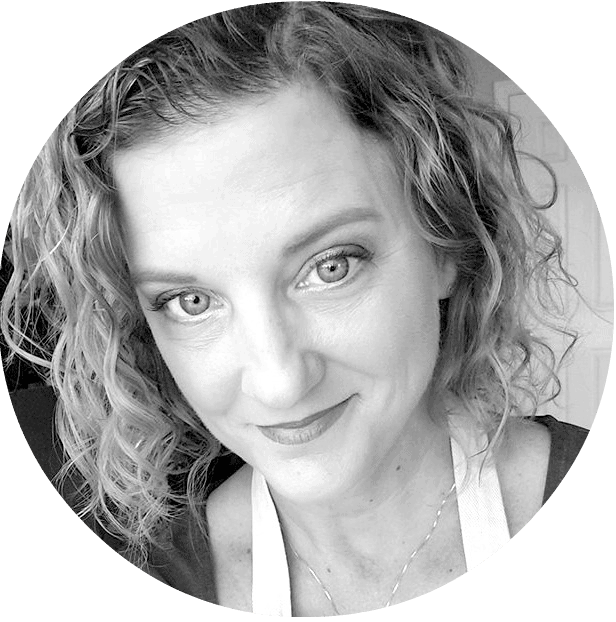 When I lived in San Antonio for graduate school and still didn’t know how to cook anything other than Tuna Noodle Casserole (no lie, that was my repertoire – and I made it two nights a week), cooking with RO*TEL was one of the first things I learned. A local family introduced me to it, and I have never looked back. Anytime I have ever had to use other means for canned tomatoes and green chilies, it was bland. So, I’m sorry/not sorry, but RO*TEL just brings it. Am I being weird? Going overboard? I mean, we are just talking a couple veggies in a can here, right? -Oh, wait, tomato is a fruit… Well, whatever. Point being that it boggles me how such a simple pantry staple can magically bring pretty much everything to a dish in the flavor department. Bold flavor and heat -but not too much heat. 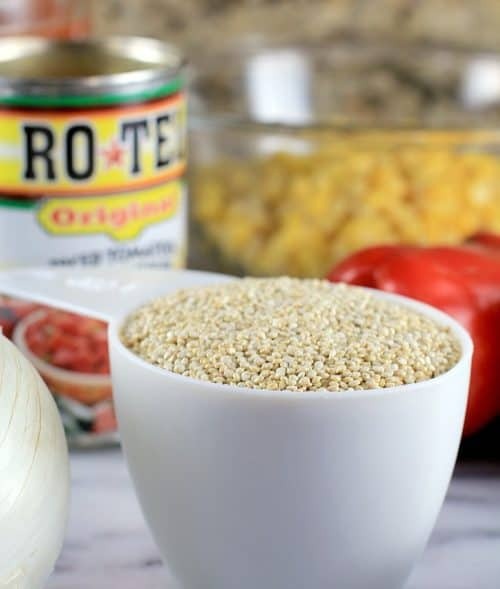 👌 For me and my family, RO*TEL is the answer to so many weeknight problems especially during a busy week. On my site already, you will find such examples as Super Quick Mexican Baked Penne, Mexicali Chicken Parmesan, and Mexican Pulled Chicken. It is a simple truth that RO*TEL saves me on weeknight pantry dives, every time. Then, of course, there is also the simple fact that it I put out a party spread of any shape or form, there will be a dish made with RO*TEL, like The Bestest Best Queso of them All. Because just like May has all the party potential, so does RO*TEL. …so I am going to take this opportunity to declare publicly that in 2 weeks, once my daughter finishes middle school, I will throw a fiesta, siesta, whatever …there will be so much rejoicing. Anywayyyy, what happens with this slow cooker quinoa here? Well, we just dump and go, that is what happens. Literally, dump the ingredients in the pot, and go away for a while. Just a while. Then come back, fry an egg to put on top, and you have got yourself a filling, luscious, healthy dinner. Easy easy. What makes this recipe different is I added some corn tortillas – and while this all cooks, those tortillas kinda blend all in and impart that “tamale” corn flavor to the whole thing. So delicious! Annnd by the way, this reheats well too. So I had leftovers without the egg, but instead topped with fresh diced avocado, and it was also really good. So that’s it folks! This dinner has all the flavor you could want for a super simple dinner from the crock-pot. Liven up your week! And don’t break even a sweat doing it. 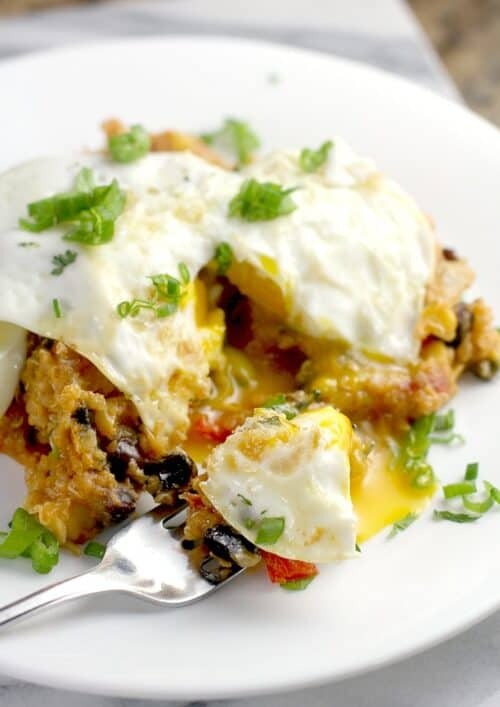 Insanely healthy, slow cooker quinoa with simple, wholesome ingredients and topped with a beautiful sunny egg. 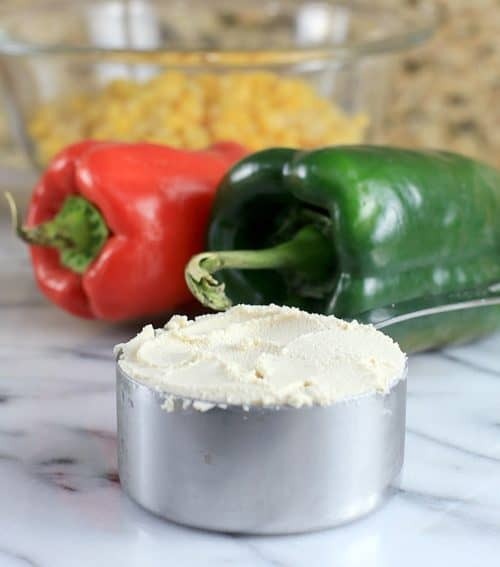 Dump all the ingredients up through the cashew ricotta in a crock-pot. Heat on high 4 hours or low 6-8 hours. Stir in the cilantro and green onion. Cook the eggs over easy in a nonstick pan with olive oil. 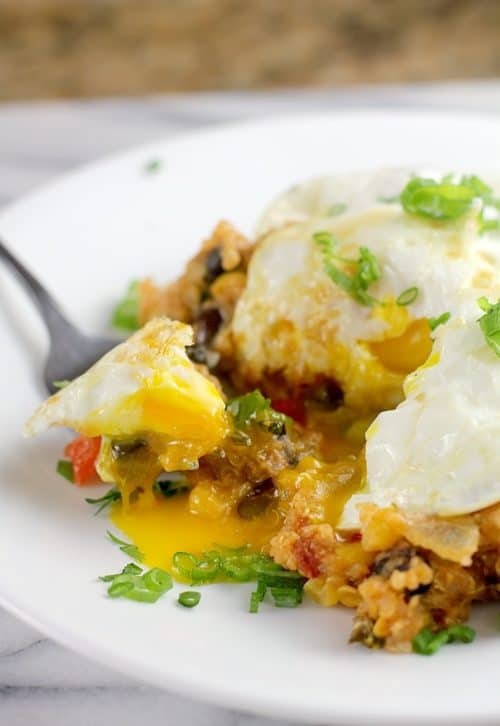 Serve the tamale quinoa in a bowl topped with a runny egg and green onion. Yields: 6-8 servings. If serving children or anyone that can't handle heat, use Mild RO*TEL. <a href="https://ericasrecipes.com/2017/05/basic-cashew-ricotta/"> Basic Cashew Ricotta</a> is my easy, non-dairy substitute for cream cheese. If not desiring to use that, substitute cream cheese. This sounds wicked good!! I am a big fan of casseroles because they seem to go a long way in a house full of growing boys. oh, adding this to my GF pinterest board…thanks. With a new baby I pretty much only use a slow cooker to cook. This sounds AMAZING! Def trying it! This looks delicious! I love using slow cooker. This looks delicious! 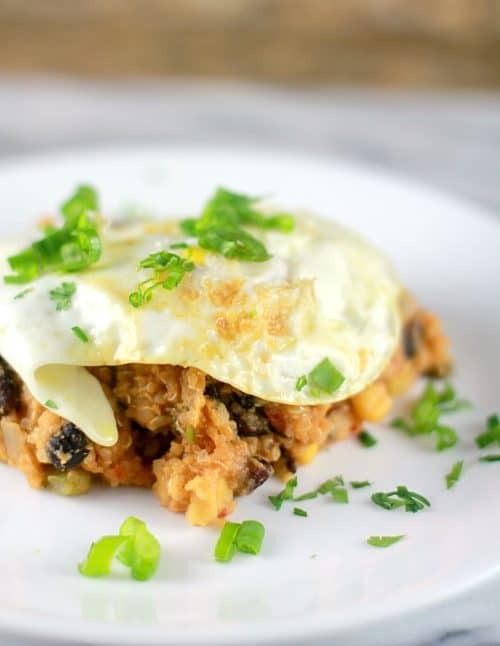 I love quinoa and casseroles are one of my go-tos since they’re so easy. I really need to invest in a slow cooker. Another reason for me to love my slow cooker. Ever since I got mine, I have made no fuss delicious meals. I will add this to my slow cooker recipe collection and include it in my meal plan for next week. This casserole recipe looks so flavorful and full of delicious ingredients. I love the texture of it and how easy it is to make. Anything that is made in the slow cooker is a win in my book! 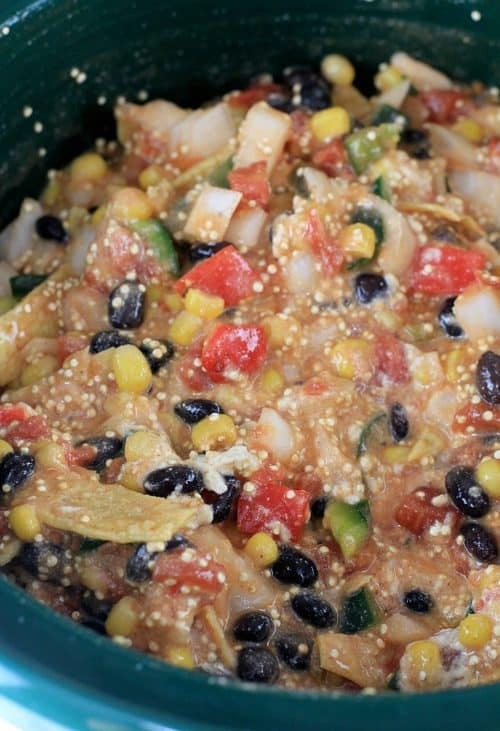 This looks so delicious – I’m adding it to our meals for this week!